Mine first burrito from Villa Mexico was served up with chicken, rice, cheese, salsa, and the usually avoided black beans. I've always been partial to the steamed tortilla. Villa Mexico serves up a grilled burrito. 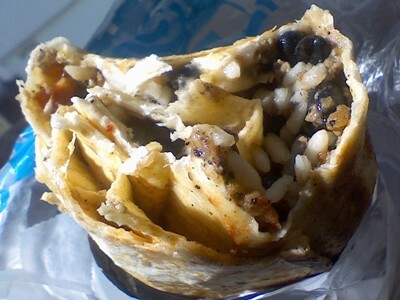 This great divide between burrito fans is well known. So here are some words for the grilled tortilla enthusiasts: you will have a hard time finding a better grilled burrito in Boston than the one served at Villa Mexico. I'll be back for certain. Say what you will about tortilla heat application methods. You can't beat gummy worms for dessert. This Villa Mexico meal was rated: 7.1. Burrito Blog has long been a fan of hole in the wall establishments, but this is something different. 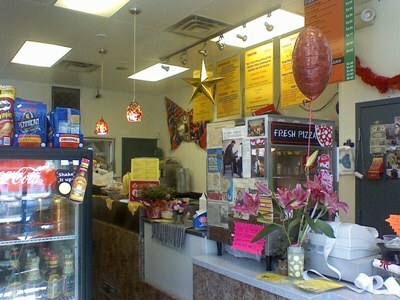 Villa Mexico is the main attraction in the mini mart of Grampy's Gas Station on Cambridge Street (Map) across from MGH. Formerly a gas station deli, Villa Mexico started in 2006, the latest culinary expedition of owner Julie King. Check out the official website here, and somebody else's video found on YouTube of the exterior below.